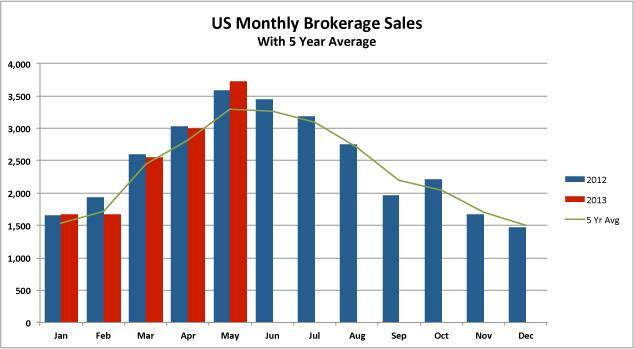 U.S. brokers reporting in SoldBoats.com had a good month in May, selling more boats than in any single month since 2007. Sales had improved in March and April, compared to 2012, but in May they climbed significantly, with 3,730 boats reported. This was well above the five-year average for May, of 3,293 boats sold, and also more than 100 boats above 2012, when 3,589 were sold. Sailboat sales continued relatively strong, with 607 boats sold, a 5 percent increase compared to May 2012. More importantly for the market as a whole, sales of powerboat also rose 4 percent, to 3,123 boats. Better sales were reported among all sizes of boat 45 feet or shorter, with 1,691 closings for boats under 35 feet, a 4 percent gain. In the 36- to 45-foot range, sales were 3 percent higher, with 759 boats sold. The only size range to record lower sales was 46 to 55 feet, down 3 boats compared to May 212, with 178 boats sold. Big-boat sales were also strong. Among superyachts (over 80 feet), 20 were sold, up 10 from the year before. And in the 56- to 79-foot size, 82 boats changed hands, up from 76. The total value of boats sold in May rose by $98 million, mainly on the strength of superyacht sales (up $91 million). By contrast, boats 56 to 79 feet sold at a total price that was $6 million or 10 percent below the previous May. The market under 55 feet made up the difference, with a total value gain of $13 million. Through the first five months of the year, overall sales were 1 percent lower than in 2012, with 12,659 boats sold. The total value of the boats sold was 15 percent higher, with $1.66 billion changing hands. Karma Yacht Sales is a Full Service Dealer. Sales~Service~Brokerage. As YBAA members we operate with the highest level of integrity in representing you on the buying AND Selling end of the transaction. We represents ALL types of boats, not just Beneteau. Contact Us to inquire about our Brokerage Services. Beneteau FIRST 25S: When you just have to get out and SAIL! Summer has finally arrived! There is no problem getting a Slip in Chicago- you need an affordable boat. Karma Yacht Sales has the answer: The FIRST 25S! We currently have Hull #640 available to see by appointment and immediate delivery for this season.